Male (foreground) and female adult Eld's deer photographed by a camera trap at a waterhole in Mondulkiri Protected Forest, a protected area inside northeastern Cambodia's Eastern Plains Landscape. With their manes and bow-shaped antlers, Eld’s deer are a distinctive looking character species of the Lower Mekong Dry Forest Ecoregion. In contrast to their more common cousins, Sambar, Eld’s deer prefer dry and open forests. In Cambodia, in the first decade of the 21st century, the species declined by 90% or more. 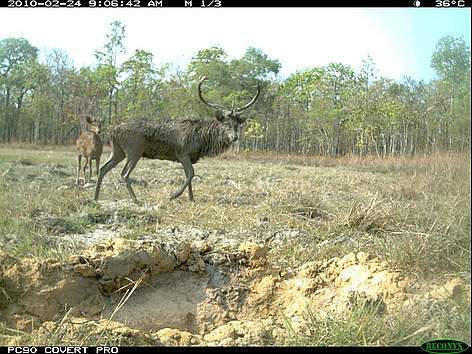 The Indochinese subspecies of Eld’s deer is considered highly threatened – besides two populations in Lao PDR, the species only remains in northern and easterns lowland forests in Cambodia where densities are worryingly low. As a result, the small remnant groups that are patchily distributed in Cambodia’s Eastern Plains Landscape are highly significant for the survival of this beautiful species.